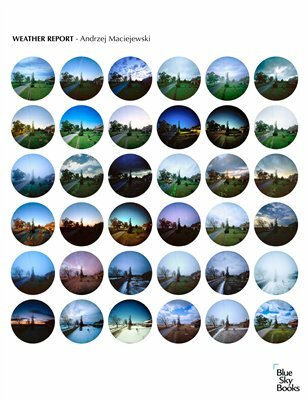 Weather Report features 36 photographs of the same place in different weather conditions, taken during the period of one year. I tried to capture the elusive and volatile phenomenon of weather. In the summer you only have a vague memory of how your garden looked like covered with snow in the winter. In the evening, it is difficult to recall how the landscape looked in the entirely different light of morning. This series shows these various moments, various looks of the same place gathered together, easy to compare and trace the changes. The photographs were taken using a 6 ft x 6ft x 10ft walk-in camera, constructed by me specifically for this project. I used high quality 4 x5 lens and 8x10 colour transparencies. The titles of the pictures contain information about the exact date, time of the day and weather conditions at the time the photographs were taken.